Finally the ice and snow seems to have finished for the time being, being replaced today by strong gusting winds from the East. A later than usual start as we stopped for some breakfast on the way at the Golden arches Restaurant. Two plates of plastic looking Eggs, a Sausage thing and a hash Brown was not very inspiring. Not many Cafes open on Sundays so its the best we can do. Today its only going to be a fairly short session as i have to be home for work by half Four. We quickly catch a dozen live baits, prep the boat and head off downstream to the outfall area. Nobody else is fishing as we turn the corner so we moor up tight to the sluice wall and both get Two rods out, one dead and one live bait on each. The skies are looking very grim and the wind is gusting every few minutes but we are quite sheltered against the wall. We are fishing about an hour when my live bait float buries instantly without warning. I pick up the rod, wind down and strike into, Nothing ! A dropped run. A quick check of the bait and we can see just the tip of the tail is marked lightly so this little Roach has had a great escape and is released almost completely unharmed. A new bait is put on and re cast into the same area. This proves to be the only interest we get here and a move back into the boat yard is on the cards at some point. 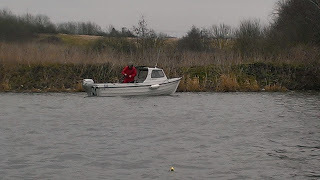 Just before we do start to move, another small boat comes round the bend and stops almost straight in front of us on the opposite bank. 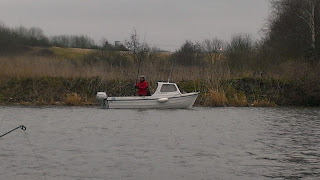 One of the anglers on board then throws a fairly light looking mud weight over the side while the other guy deploys a second one at the back of the boat. They are facing downstream with the wind howling in behind them. They soon have a rod each in the water and seem to be reeling in every couple of mins to re cast. No sooner have they sat down the wind is at them again and then the fun begins... One of the guys who is dressed as an extra from the Red arrows display team is frantically wrestling with his rod as the wind has spun the boat sideways, wrapping his gear round the front mud weight. As they try to un tangle that, the second rod is now round the back anchor and its turning into a comedy show. We both sit and watch as it goes from bad to worse, Rods, Lines and anchor ropes everywhere, the boat now side on being dragged away on the wind and the two guys needing four more pairs of hands at least. We should have really offered to help but to be honest we were in stitches watching it unfold. 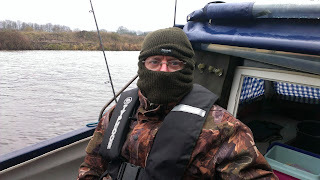 I put my full balaclava on so they could not see me laughing ! 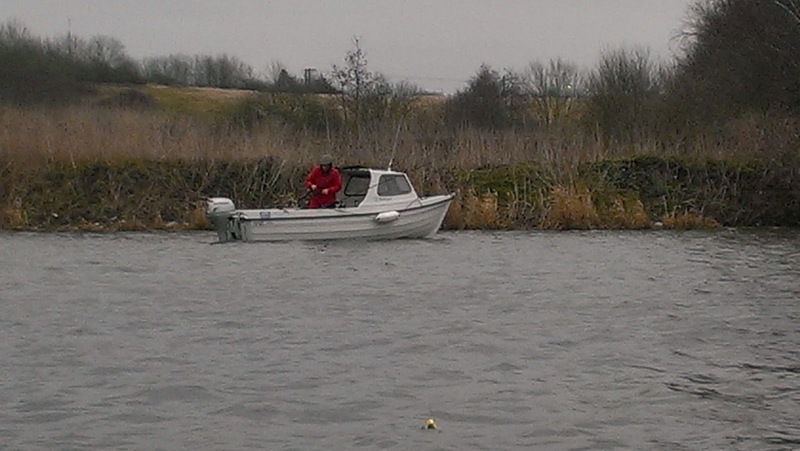 Eventually, somehow they got both rods in, still attached to the mud weights and drifted off out of sight. A few minutes later they re appeared back under engine power and went past us back up stream both looking quite embarrassed as they went past. The guy in the Red boiler suit had a face the same colour ! A first blank for both of us for quite a while but the entertainment was first class.